Large evergreen shrub or small tree. Large leathery leaves, up to 20cm long, with a buff-grey or cinnamon-brown indumentum underneath. 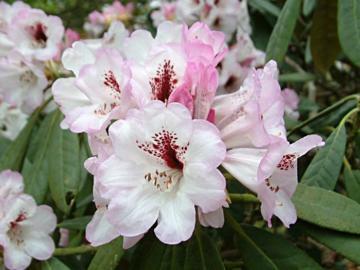 Trusses of bell-shaped, rose-pink to white flowers, blotch and spotted dark crimson inside, in April and May. Native to Sichuan, China, discovered and introduced by E.H. Wilson in 1908.